You can now paste in a comma separated list of Stopwords into the Stopword input and SearchWP will automatically create separate Stopwords for you. This will help when you’d like to import a list of Stopwords directly into the interface. Partial matching has been changed slightly in version 3.0.5. In version 3.0 partial matching was implemented in such a way that it only applied when exact matches were not found. This went against the implementation of LIKE Terms and Fuzzy Matches (the Extensions that SearchWP absorbed in version 3.0) so this behavior has been reversed. When partial matching is enabled SearchWP will now search for partial matches regardless if there are exact matches. You can utilize the searchwp_partial_matches_lenient filter to restore the behavior from version 3.0 if you’d like. The third party libraries used by SearchWP have been reorganized and updates. There are two reasons for this: primarily there was a security notice related to TCPDF which is a library used by SearchWP for PDF parsing/indexing. This security issue was not exploitable given SearchWP’s implementation as it relied on a malicious actor uploading a specific file type which needed to then be used in the creation of a PDF using TCPDF. SearchWP does not generate PDFs nor does it facilitate file uploads. While this exploit does not directly relate to SearchWP it is important to remain updated. The second reason for reorganizing these dependencies is an effort to circumvent an issue with plugin updates in certain Windows server environments. Here’s a quick (3 minute video) going over a few of the UI updates, followed by a more detailed breakdown of what’s new/changed in version 3.0! 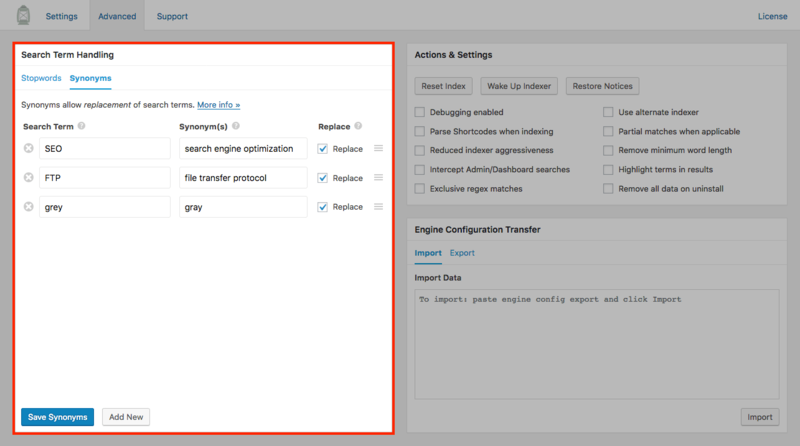 The Advanced tab of the SearchWP settings screen has been rebuilt and modernized in many ways, take a look! The entire interface was re-thought from the ground up based on common use cases. 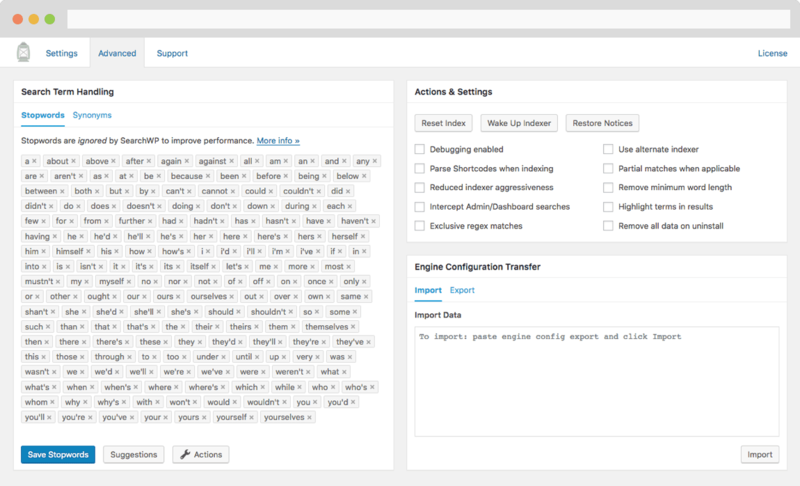 The goal was to modernize the interface based on lessons learned from rebuilding the engine configuration interface in version 2.9. Beyond implementing a localized list of default stopwords, SearchWP 3.0 will suggest additional stopwords based on the content of your site. This will help to further optimize your index resulting in faster searches with more relevant results! Term Highlight has been integrated as a Setting that can be enabled with a single tick of a checkbox, managing ignored terms has been moved directly into the Stats screen (more on that in a bit), and partial matches has been improved in a number of ways as well. Prior to SearchWP 3.0 there were two Extensions to help with partial matches; LIKE Terms and Fuzzy Matches. They both did different things, but at first glance it was very confusing as to why you’d use one over the other, or both for that matter. Partial matches have been directly integrated into SearchWP 3.0, and the details of the implementation have been made available in the documentation for that feature. Search statistics have always been an important part of the data provided by SearchWP to site owners. Being able to monitor what your visitors are actively searching for can be a big help in determining what content changes to make on your site. 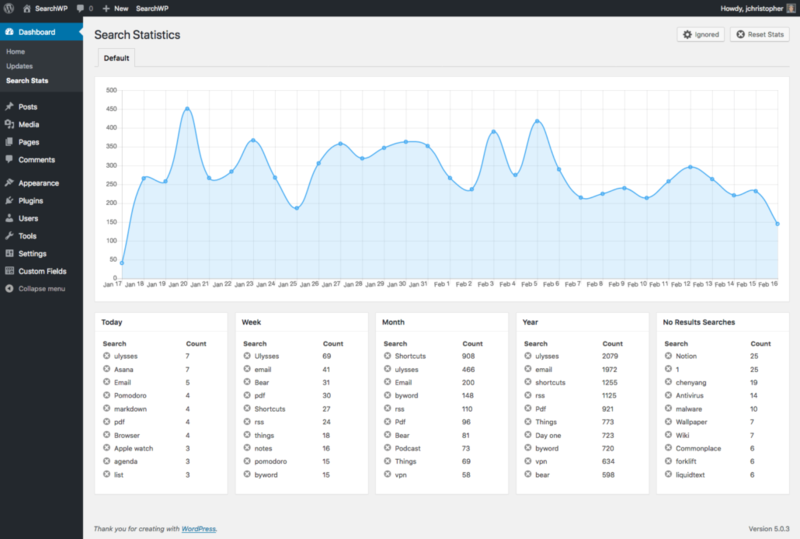 The existing stats screen hadn’t changed much since version 1.0 and with the need to integrate management of ignored terms and the ability to reset the statistics it was time to rebuild and modernize it. The charting library has been updated and UI rebuilt in a more modern way which will make stats review a much more pleasant experience going forward. If you’re looking to get more out of your search stats, be sure to check out the Metrics extension! Adding a repeatable entry will include all sub-fields of that repeatable ACF field, saving you the trouble of adding individual sub-fields. This functionality has been supported by SearchWP but prior to 3.0 you needed to use your own hooks to explicitly add support for partial meta key matches. SearchWP 3.0 will also remove ACF reference fields (the fields with the same meta key but prefixed with an underscore) to clean things up for you. 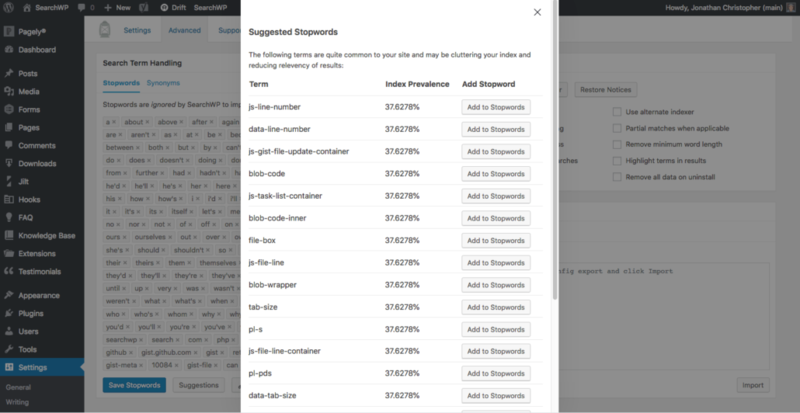 By default SearchWP 3.0 will parse content that has been input using blocks (a.k.a. Gutenberg) as introduced in WordPress 5.0. For the time being there is no way to give individual blocks specific weights, all of the content generated from parsing the block will be index as it was entered into the main post content. If you feel that giving control over individual blocks would be useful in an upcoming version of SearchWP please send over your input! 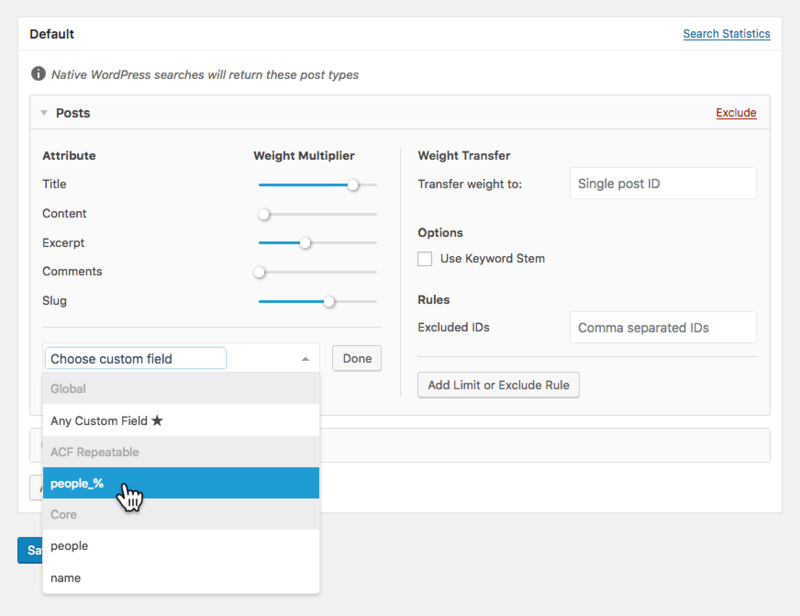 The goal of SWP_Query was to mimic WP_Query so as to save you trouble when migrating from a traditional WordPress Loop for search results. These new methods should make it easier for everyone to take advantage of what SWP_Query has to offer! Version 2.9.16 of SearchWP is now available for all active license holders. In this release SWP_Query received a few updates and a number of fixes have been put in place.